This Roasted Veggie Breakfast Bowl is a breakfast heaven, if you will. 😉 It is full of flavor, loaded with the nutrition of leafy greens, has the protein you're looking for, it's basically a perfectly balanced meal in a bowl. Thumbs up, right? The inspiration of this breakfast bowl came from one of my favorite places to visit when I head "Home" to Oregon. So if you ever get the chance, stop in at RedHills Market and get the original! Of course this meal is gluten-free and simple, so get after it! The ingredients below are for 1 bowl/person, so add all the ingredients you want to feed more hungry bellies. -1 or 2 Organic (Pasture-Raised is what I recommend) Egg(s)- I fried mine, but you could poach, scramble, your choice. -Add anything else you may like and send me your ideas! My favorite extra ingredient is avocado. Dive in, and Enjoy! 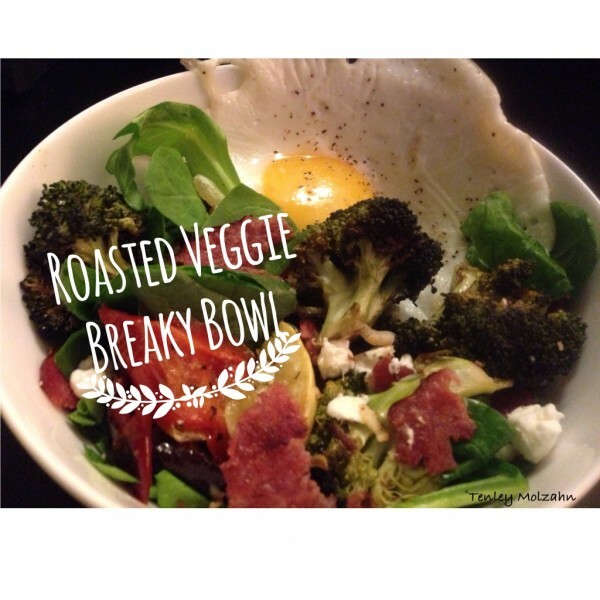 I love having this ‘Breaky’ Bowl for lunch or dinner too!